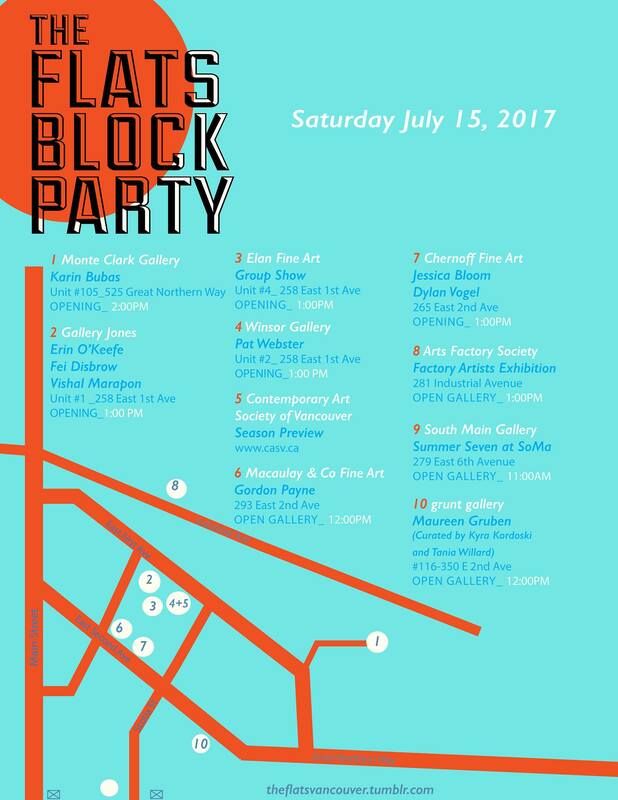 Come on down to The Flats on Saturday, July 15th from 1-4pm to see what’s good in the ‘hood, have a summer drink, feast your eyes on some art, and meet fellow art enthusiasts. The Contemporary Art Society of Vancouver will have a booth at Winsor Gallery, so pop on by and say hello and learn about our upcoming programming schedule. Renowned local galleries Monte Clark Gallery, Winsor Gallery, Gallery Jones, Macaulay & Co, Chernoff Fine Art, South Main Gallery and more will play host to crowds of local collectors and art-goers as exhibitions are launched, artist talks are given, and the city is brought together to celebrate the district’s success as a cultural cornerstone. +Monte Clark Gallery opens an exhibition of new works by artist Karin Bubas. +Gallery Jones presents a summer group exhibition of works featuring artists Erin O’Keefe, Fei Disbrow, and Vishal Marapon. +Winsor Gallery will be opening the Summer with “Clichés To Live By” a neon exhibition by artist Pat Webster. +Elan Fine Art opens the day with a Summer group show featuring beautiful works by artists; David Urban, Jeff Wall, Andy Warhol, Joseph Kyle, Sean Mills, Gordon Smith, WIllem de Kooning and more. +Chernoff Fine Art opens the day with a duo solo show entitled, “Image. Error” featuring artists Jessica Bloom and Dylan Vogel. +SoMa will showcase week-long exhibitions by the following seven artists; Jennifer Gauthier, Charlie Edmiston, Zandra Stratford, Tristesse Seeliger, David Crompton, Saci Pedro, and Jeanne Fries. During The Flats Block Party, SoMa will be featuring work by Charlie Edmiston(July 14 – July 20). Born and raised in Los Angeles, Charlie began his career as a graffiti artist working in a variety of styles and mediums, including colorful mixed-media paintings, large-scale murals, and bold design graphics. +grunt features a unique exhibition by artist Maureeb Gruben entitled ”UNGALAQ” ( When Stakes Come Loose) curated by Kyra Kordoski and Tania Willard . Drawing from five bodies of work, this solo exhibition will be the most extensive mounting of Gruben’s work to date . The opening will commence June 8th at 7 pm and will run throught the Flats Block party. +Macaulay & Co. Fine Art exhibits work by Gordon Payne (b.1933). Payne began painting in the 1950s, and was associated with the Op Art movement in Vancouver during the 1960s. A long time resident of Hornby Island, Payne has continued his painting practice, making abstractions informed by a dynamic relation to the natural world.